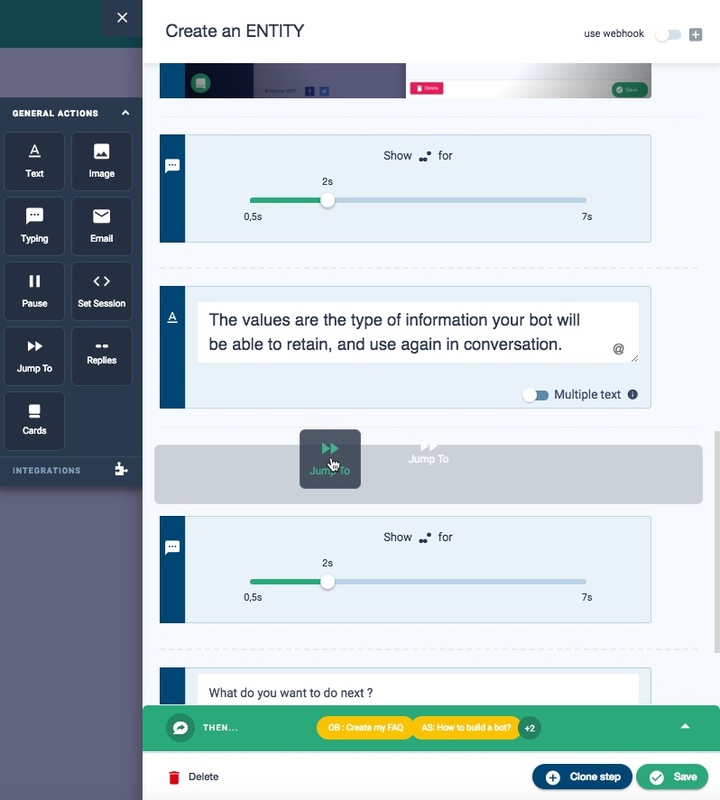 The important thing to understand about "Jump to" is this: contrarily to the "then..." part of your step, that makes the user go to another step after he/she answered, the "jump to" action will make the chatbot jump to the next step according to what had been said before, without waiting for an answer. 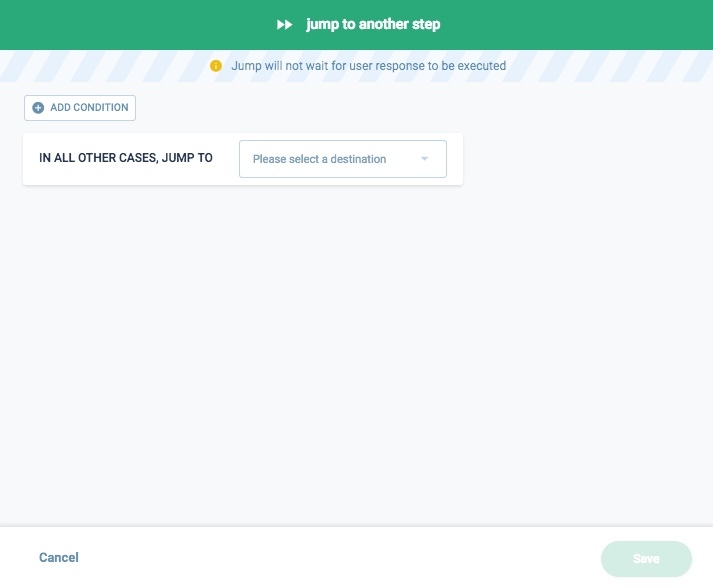 To use it, you must drag and drop the "jump to" action to the right place inside the step panel. Be careful of the order: if its condition is satisfied, the "jump to" will be executed right after the action situated above and it will prevent actions below to be performed. To configure a parameter that, if equal to a certain value, will allow the user to jump to a defined step, click on "Add condition". An area appears to define the condition you want to be satisfied to jump to a particular step. Matches intent: Here, you can use an Intent. Contains: If your user's answer contains a certain word or expression. Matches Regex: set up a "custom condition", more info here. Matches exactly: If you are sure of what your users will answer, like "yes" or "no". Is set: This one is special. 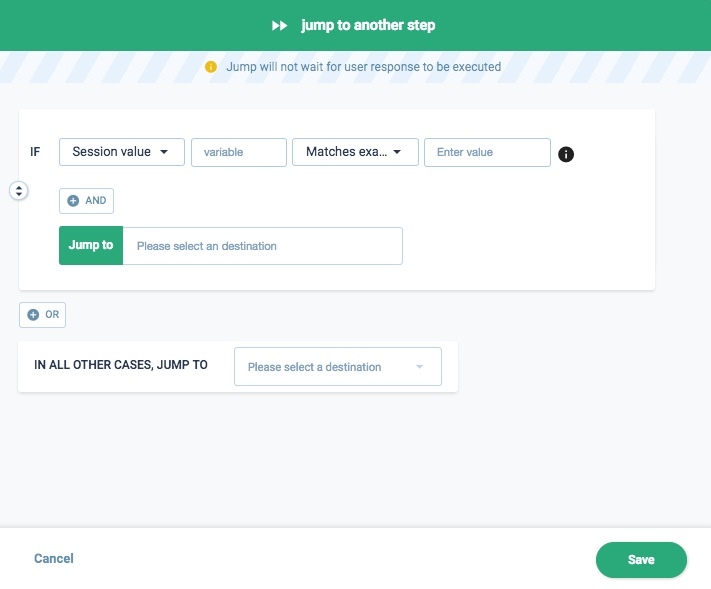 It's used if you choose to connect two steps depending on a session value. Is number: If your user's answer is a number. To add another condition that jumps to the same step if satisfied, click on the button "+ AND". Then the exact same fields (Parameter, Variable and Condition) will be displayed below the first condition. If you want to define one or several conditions that jumps to another step, then click on the button "+ OR". Then another condition area displays. The second part of the area is dedicated to the choice of the destination step or story. You can select the one you want in the dropdown list. The bottom area "In all other cases, jump to" allows you to define a story or step where to go if none of the condition defined above has been satisfied. When you're done, click on "Save". If no condition has been set, the "Save" button is disabled. 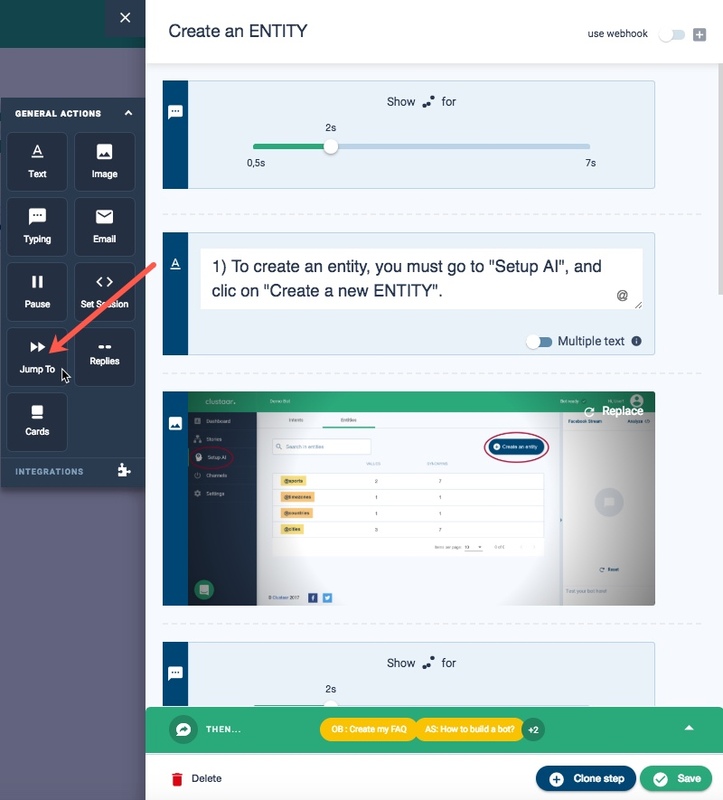 The "jump to" action appears in your step panel with the different destinations. Steps are coloured in green and stories are coloured in yellow. You can then continue to configure your step before saving it.